A savoury tart served warm is one of life’s simple pleasures. This tart is defined by the biscuity pastry base and the just set creamy custard filling that’s rich with bacon cheese and chives. A couple of years ago after eliminating wheat from my diet I discovered a fabulous unconventional shortcrust pastry recipe made with spelt, buckwheat and ground almonds. It continues to be my go-to pastry for savoury tarts. It has never let me down and freezes exceedingly well, in fact I made this tart with pastry that had been frozen for close to a month. 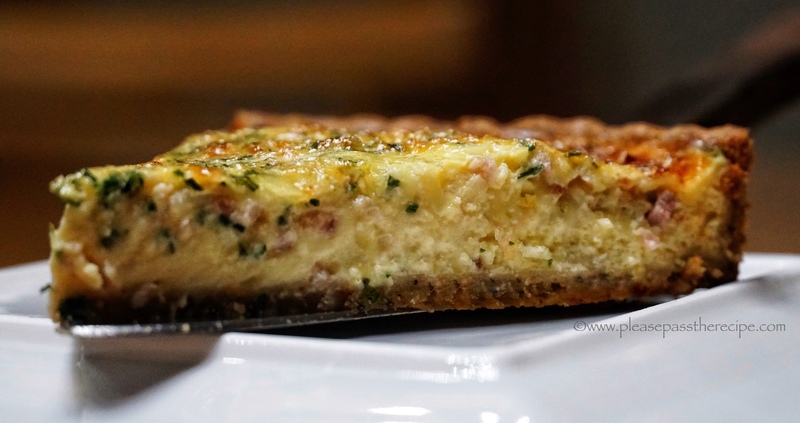 My tart filling was inspired by a classic French Quiche Lorraine simply grated cheese, finely chopped bacon or ham, a load of snipped chives and a decent grinding of black pepper. Is it a quiche or a tart, you decide. The only accompaniment this delicious cheese tart needs is a crisp leafy salad dressed with vinaigrette. Lightly grease a 2cm deep, 30cm flan tin then line with thinly rolled pastry. Bake blind according to the instruction in the recipe. Reset the oven temperature to 170C and if possible, turn off the fan forced setting. Lightly whisk the eggs with a fork then whisk in the cream and the milk. Tip the cheese and bacon mixture into the par baked pastry and even distribute. gently pour in the custard. Bake the tart in the centre of the oven until the custard is just set and the top golden brown, about 40 minutes. Remove the tart from the oven and allow to rest for 30 minutes before serving. This looks great. If you use single cream and skimmed milk does it just go flabby? Call it a tart or call it a quiche, just call me when it’s ready. Your Classic Savoury Bacon, Cheese and Chive Tart is one tart I’d very much enjoy savoring for a Sunday brunch. Thanks Ron, I stumbled across you buckwheat shortcrust recipe recently. It’s quite a while since you shared it with me, and I was full of good intentions, but it slipped to near the botton of my recipes to try pile. It’s on the top again now. Will try at the weekend…. This is my kind of food! Fabulous! Ha, that saying always makes me laugh. This ‘real woman’ would certainly eat that delicious looking quiche! Well officially this is a quiche vosgienne as it has cheese (Lorraine is only bacon). No matter what the name, it does look very good. mmm yum! I am all over this savoury tart!! *big smile* Have never ‘gone’ for a man who was not ‘real’ and they all have loved quiche which methinks this is ! Perhaps it has a few too many goodies in it for me to make it often, but I surely want to try make that yumbunctious pastry . . . all three ingredients being stars in my sky . . . This post made me feel so hungry. I love quiches/tarts and must try this pastry too. That meat ad was an ocker shocker. A good tart, served warm is irresistible, even to men…. Doesn’t matter which, this sounds delicious both ways. Clever you to come up with a gluten free crust, I’ve pinned it. Well done. This entry was posted on January 24, 2019 by ladyredspecs in Baking, Breakfast and Brunch, Cooking, FODMAP diet, Food, Light Savoury Dishes, recipes, Savoury Baking and tagged bacon, cheese, chives, FODMAP friendly, quiche, savoury tart, tart.